2012 Mean=24.9 CV=18.6%, SD=4.6 SF=23.76, CF=89.6%(7th Fleece). 2013 Mean=28.30, CV=20.50%, SD=5.8, SF=27.4, CF=71.6%(8th Fleece). substance of bone and fleece of extreme density & fineness this male is already leaving his mark wherever he works. 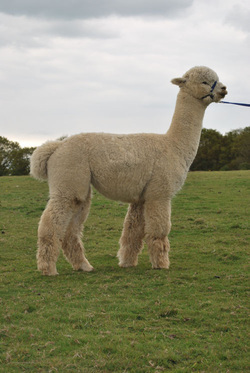 With a pedigree that includes colour, and having produced coloured cria of the highest order he has proved he is a great choice in improving your coloured breeding programme.